Three men have been charged following the release of an undercover investigation which showed pigs being 'beaten with pitch forks and kicked in the face'. 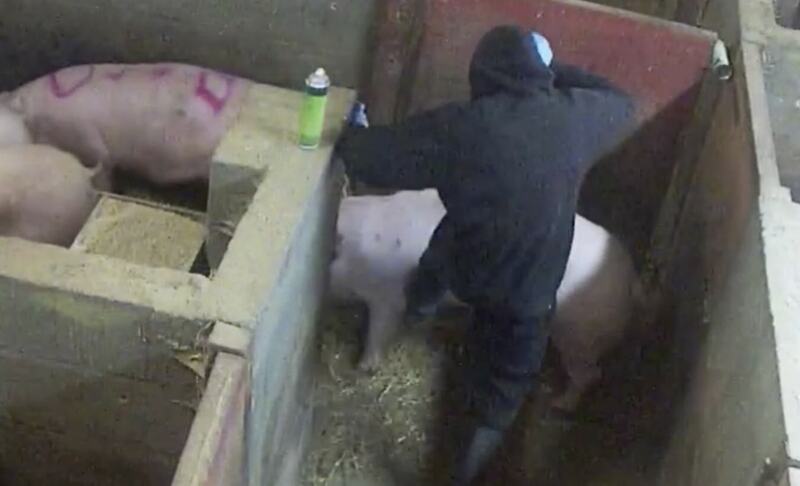 The footage was taken on Fir Tree Farm in Lincolnshire, which has a herd of around 10,000 pigs, by leading animal protection agency Animal Equality. It shows workers apparently swearing at animals, as well as slamming gates on them, and jabbing them repeatedly with pitchforks - as they can be heard squealing. Artis Grogprkevs, 31, Gavin Hardy, 39, and Troy Wagstaff, 30, have been charged with causing unnecessary suffering to a protected animal, with the incidents allegedly taking place between April 2-27 this year. Under the prosecution, which is being brought by the RSPCA, all three are are accused of inflicting blunt force trauma, physical violence, and using a pitchfork inappropriately. In addition, Wagstaff is also charged with one count of spraying paint into a pig's nose. The three men are due to appear at Grimsby Magistrates Court on November 23.